I did a recent review on Beauteque's recent subscription bag, which you can view here, but they also do one-off bags like the Head to Toe Snail Bag! This bag is $24 (plus shipping), which you can purchase here, and just select where it will be shipped, US, Canada, or Europe. Shipping for this bag is sent USPS Flat Rate, and seeing as how it was pretty big and heavy, I think the $7 shipping for the US bag is reasonable. The info card this month was included and laminated! Great for spills (even though of course nothing spilled), but it was a little shiny for the camera! 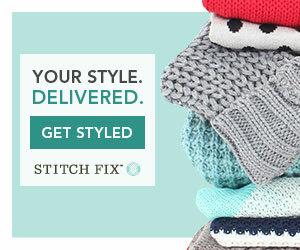 But I love that they include how to use each product, in a very short sentence or two. 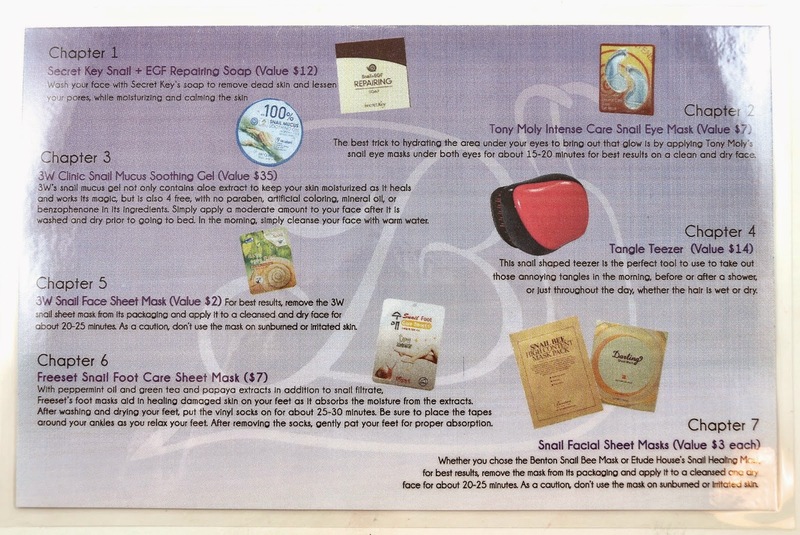 It makes it easy to tell at a glance how to use each item, if you're not familiar with asian skincare products. 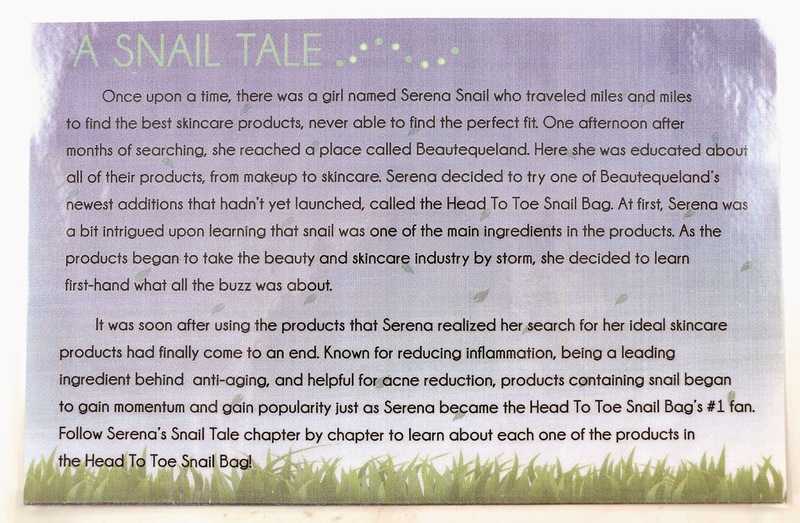 And I loved the little story on the front of the benefits of snail in skincare. How to use: "Wash your face with Secret Key's soap to remove dead skin and lessen your pores, while moisturizing and calming the skin." 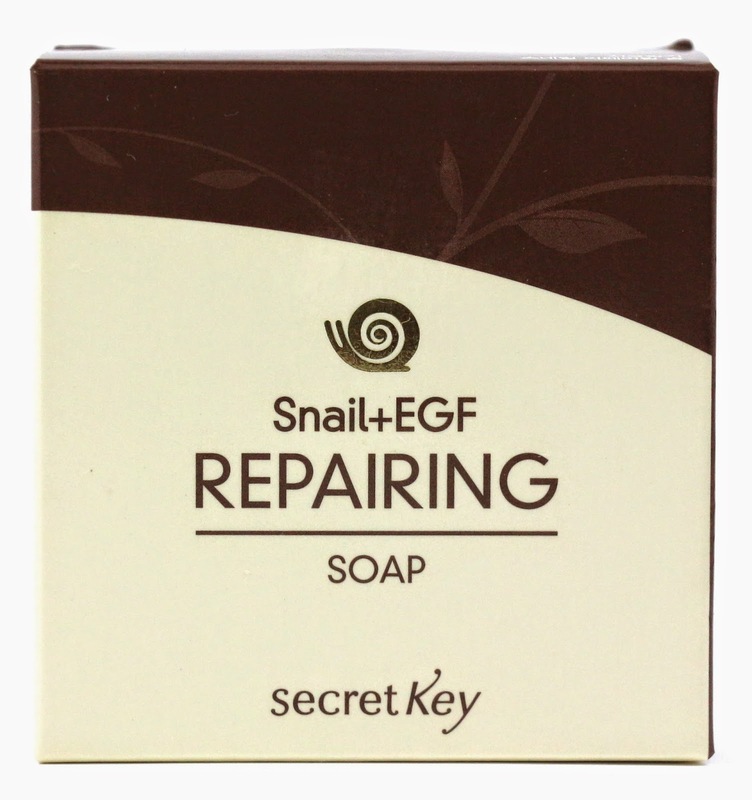 My thoughts: This soap has an herbal scent, which I'm not sure I love, but I have liked other products from the Secret Key brand. I prefer liquid cleansers over soap bars, but if this one can remove the dead skin cells from my face and lessen my pores, I'd take this over any cleanser I've tried so far! 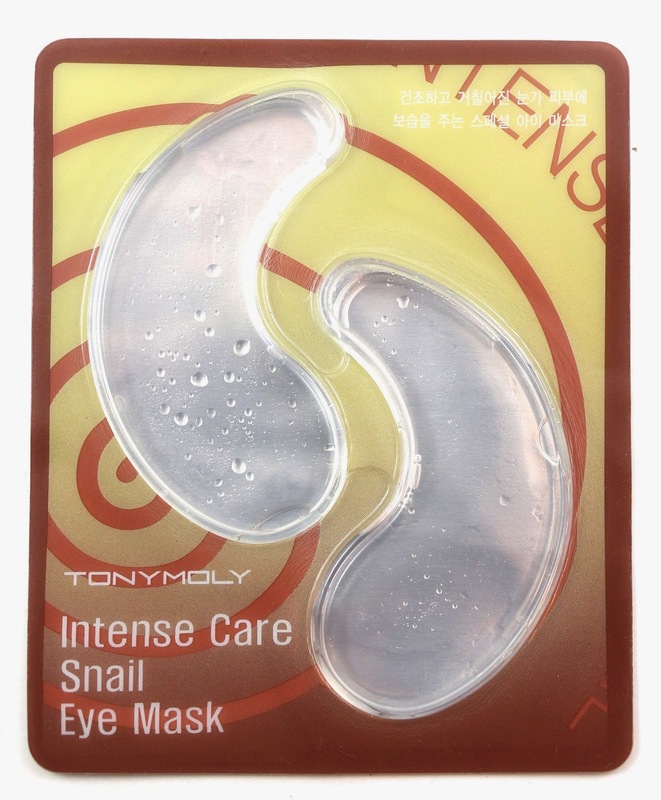 How to use: "The best trick to hydrating the area under your eyes to bring out that glow is by applying Tony Moly's snail eye masks under both eyes for about 15-20 minutes for best results on a clean and dry face." My thoughts: I wanted to get a chance to use this before I posted my review, but I've got some sort of eye irritation and I have taken all eye products out of my routine for the time being until it clears up. But Tony Moly is a well known Korean brand, and I know there will definitely be a time coming up where I will want to give some extra TLC to my under eyes. How to use: "Simply apply a moderate amount to your face after it is washed and dry prior to going to bed. In the morning, simply cleanse your face with warm water." 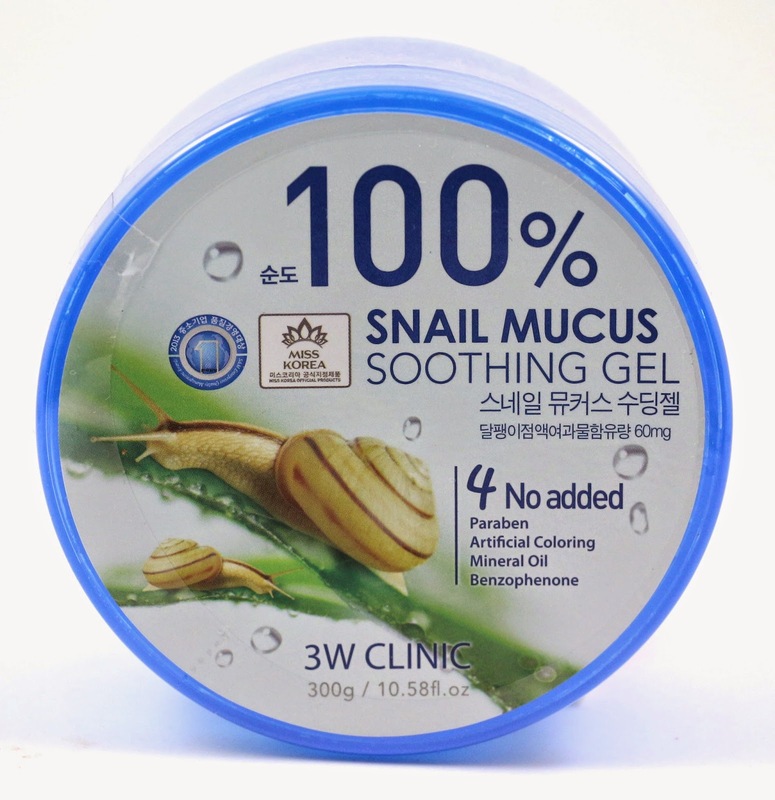 My thoughts: This reminds me of aloe vera gel, except made from snail mucus! It has a pleasant smell, kind of the same smell they add to aloe vera gels, and I bet this would also be soothing for sunburns as well. When I applied it, it felt very cooling and soothing, but you do have to kind of scoop it out of the jar. It doesn't stick to your fingers well. This jar is huge and heavy, the heaviest item in the bag, and also the highest value item. But I like it, I would slather myself in this if I had a sunburn, or just on my face to calm any irritation. 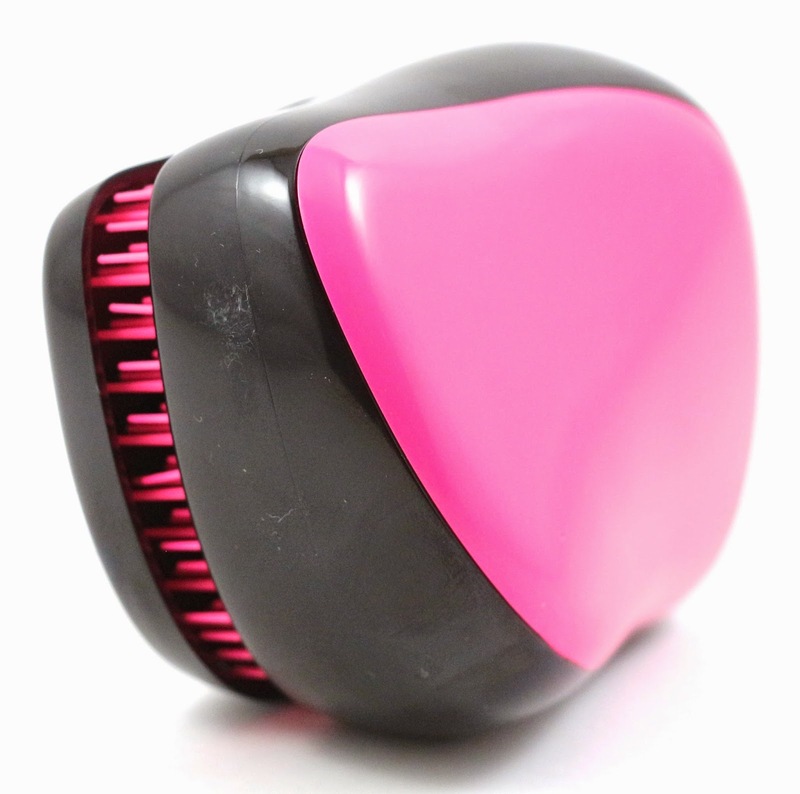 How to use: "This snail shaped teezer is the perfect tool to use to take out those annoying tangles in the morning, before or after a shower, or just throughout the day, whether the hair is wet or dry." My thoughts: The first time I used this I tried it on wet hair, as I tend to get really bad tangles if I don't immediately use some of my detangling spray and comb my hair out. This worked better than my comb does! The teeth are father apart, so it doesn't pull on any tangles you have, but gently goes through them. It even has a handy plastic protector that clips on over the teeth, so you can easily throw this in your purse or bag without worrying about it getting damaged, or damaging your things. 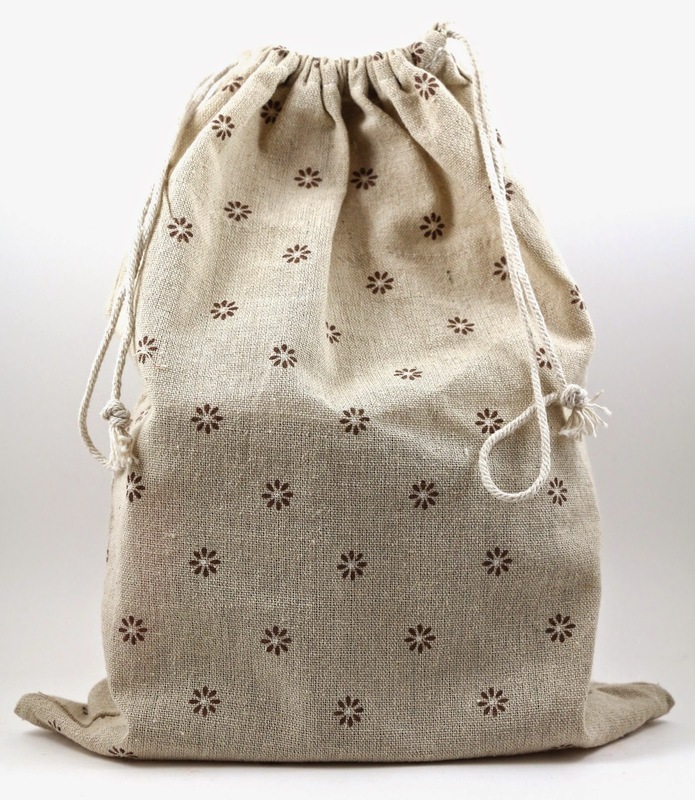 It was included in the Head to Toe Snail Bag because it is shaped like a snail! I love the inclusion of useful tools in the bags, I hope Beauteque continues to include them. 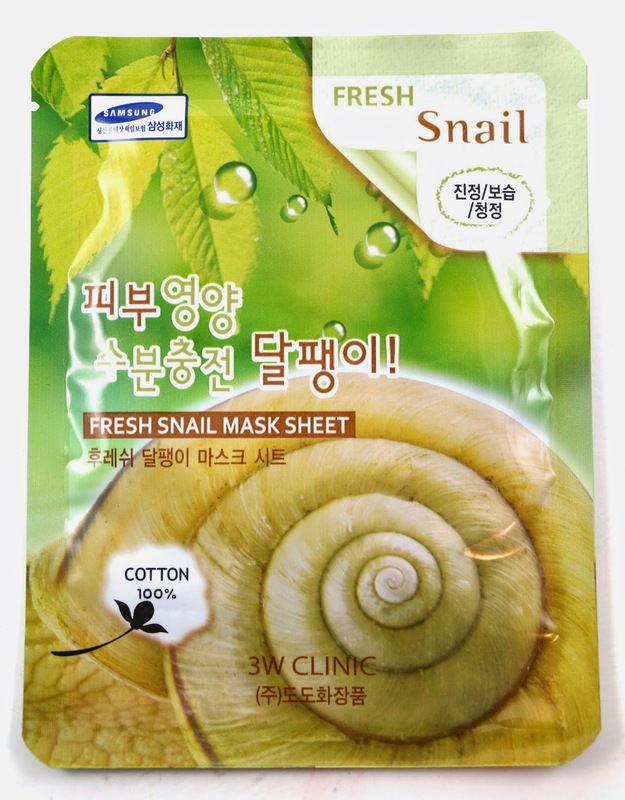 How to use: "Remove the 3W snail sheet mask from its packaging and apply it to a cleansed and dry face for about 20-25 minutes." My thoughts: This sheet mask was covered with essence, and it felt really cooling and soothing on my face. It had a slight floral scent, and overall I liked it. What I really want to know is why there is a Samsung logo on a sheet mask? Seems like an odd pairing to me! How to use: "After washing and drying your feet, put the vinyl socks on for about 25-30 minutes. Be sure to place the tapes around your ankles as you relax your feet. After removing the socks, gently pat your feet for proper absorption." My thoughts: There are typically two types of foot masks, a moisturizing foot care mask (like this one), and a peeling mask. I have been wanting to try the peeling kind, but this moisturizing had a nice peppermint scent, and felt very nice and moisturizing on my feet. I always love using hand or feet masks because it's an easy way to get moisture into your skin, without getting lotion all over the place or on your sheets. The product is all contained in the plastic socks and doesn't escape while using them. How to use: "Remove the mask from its packaging and apply it to a cleansed and dry face for about 20-25 minutes." 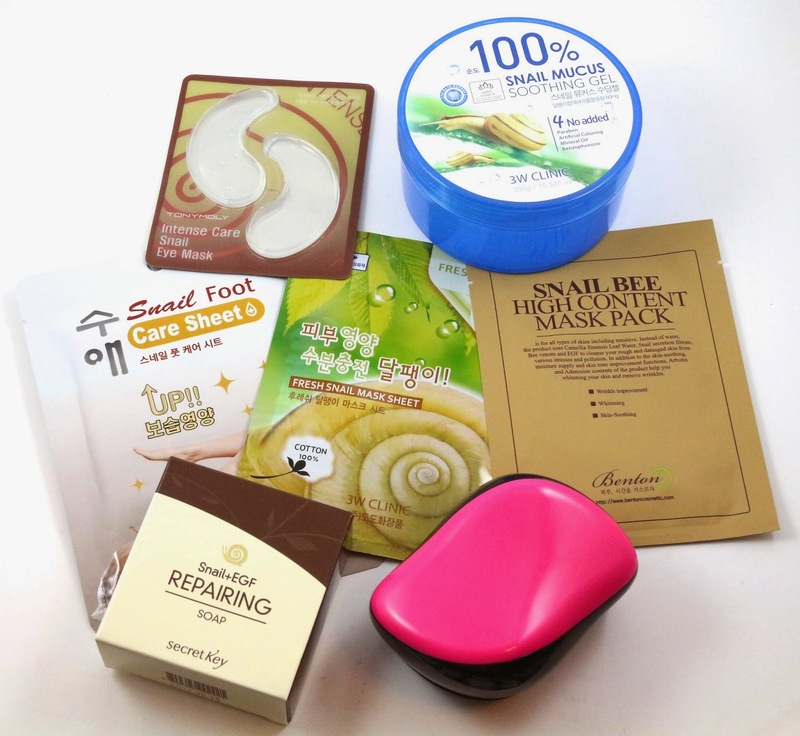 My thoughts: There are two choices for this mask when you purchase the Head to Toe Snail Bag, either this one or the Etude House Snail Healing Sheet Mask. 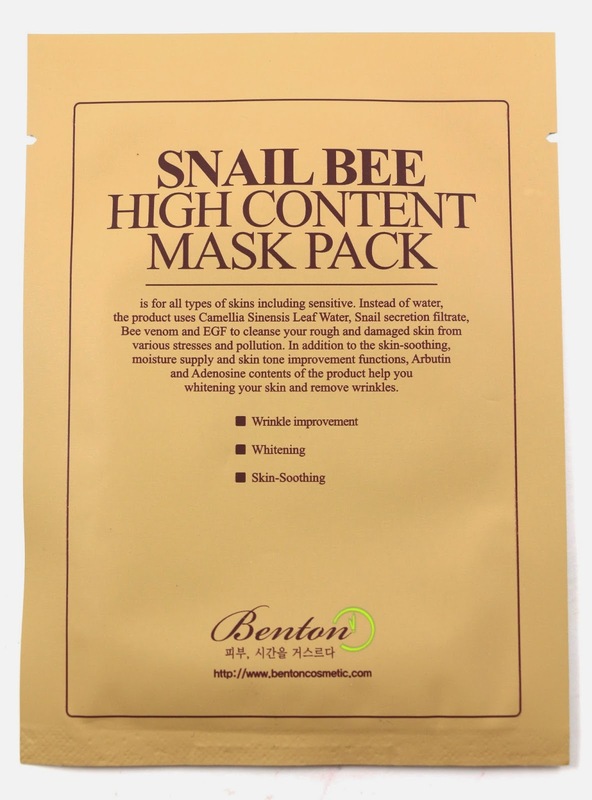 Benton has had a little drama recently concerning their products (you can do a search if you're so inclined), but I wanted to try this mask because other than the drama, they are known for good quality products. 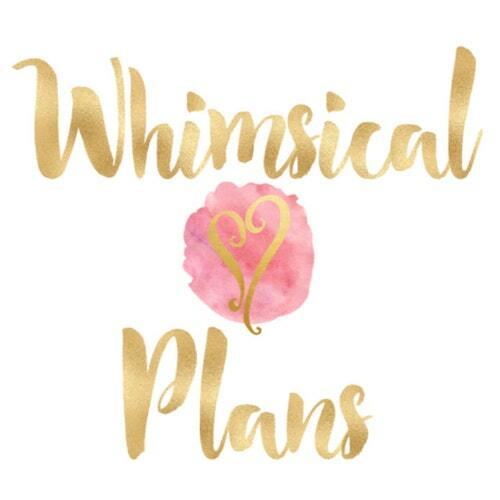 Overall, I really enjoyed the Head to Toe Snail Bag, and even though it's stated to have a $80 value, after looking up some of the products at other online retailers, I found it really had about a $50 value. 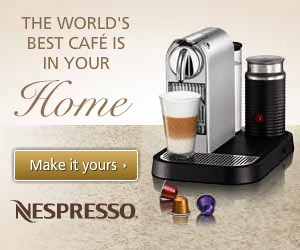 Even possibly a little less depending on where you look for a product. And with this bag having a price tag of $31 including shipping, it's a little low on overall value. 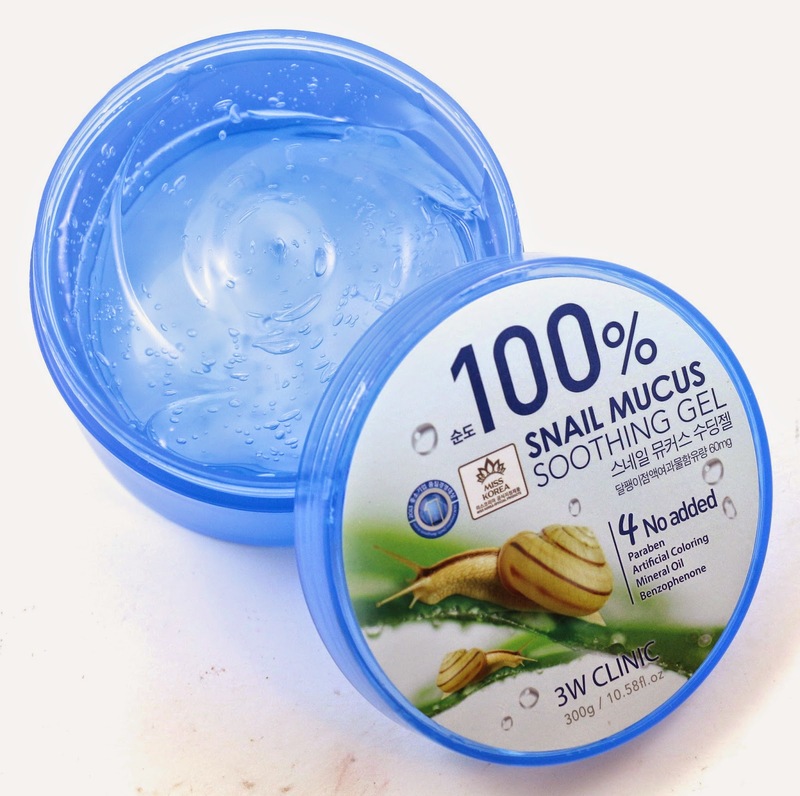 I know there are some bigger brands that have snail products, I would have liked to see some more variety, as there were two products from the same brand that I have personally never heard of. I do really like the inclusion of a beauty tool in each bag they do, especially since it's usually a tool I don't have anything else like, and they have worked really well for me so far. But there were two face masks in this bag, I feel as though one of those could have been a different product, maybe a snail cream or something else just to have a little more variety. Masks are not usually very expensive, so having two really cuts down on the overall value. Head to Toe Snail Bag is a good option. 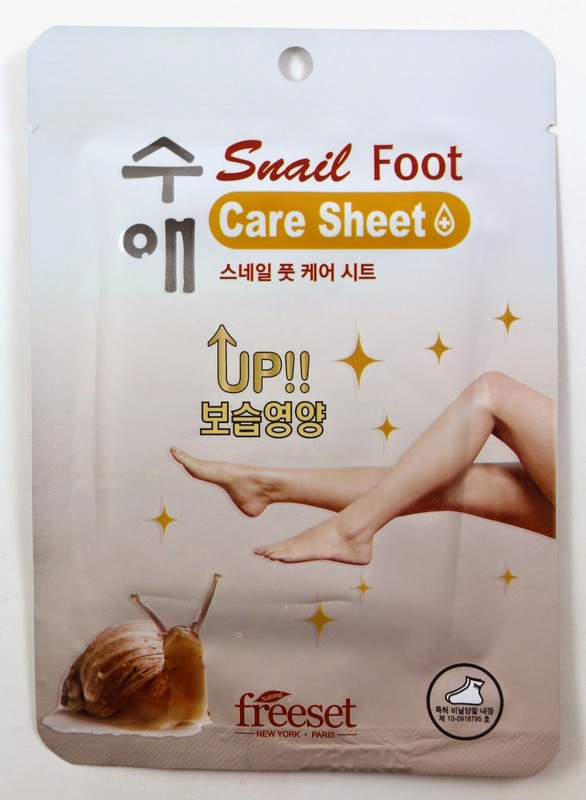 Use coupon code KELLY-SNAIL to get a free sheet mask included with your Head to Toe Snail Bag order! Disclosure: I received these products complimentary for review. This is my honest review.